A massive outbreak of acute watery diarrhea is sweeping through Doolo zone, in Ethiopia’s Somali region, and it’s exacerbated by one of the worst droughts in 30 years. In response, teams from Doctors Without Borders/Médecins Sans Frontières (MSF) are working alongside Ethiopian health authorities to bring the outbreak under control while warning that more external funding and resources are urgently needed to stop the disease from spreading further. Officially declared on April 7, the outbreak has affected more than 16,000 people, according to the World Health Organization since the start of the year. Local authorities report 3,500 new cases per month. So far, the government has deployed more than 1,200 health professionals, including doctors and nurses, and set up 100 treatment centers. Even if an overall decline in acute watery diarrhea cases is registered in the region, the risk of re-infection remains high. Despite all of these efforts, MSF teams working in some of worst affected locations in Doolo zone say that there are still serious shortages of infrastructure and other needs—such as boreholes, pumps, trucks to transport water, and storage tanks for safe drinking water—and a lack of international organizations responding to the emergency. People in this region, mostly nomadic, generally take advantage of the rainy season to store water for the rest of the year. But little rain has fallen in the past two seasons, which has resulted in a severe drought, with people in many locations currently surviving on less than two liters of water per day. Without sufficient clean water, many have been forced to use untreated water sources, a cause of the spread of acute watery diarrhea. For health staff, treating patients for acute watery diarrhea without sufficient supplies of water is a major challenge. 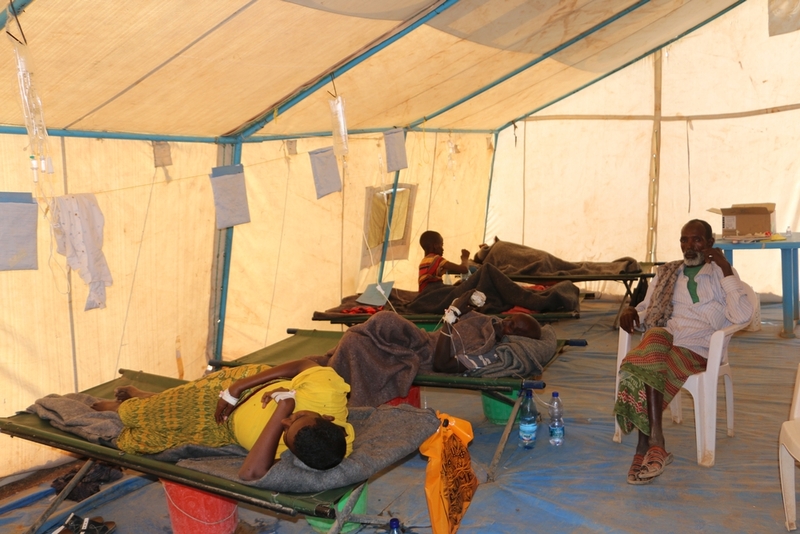 Many health centers have been overwhelmed by the suddenness of the outbreak and MSF has worked alongside its partners to strengthen support to the government’s health centers, as well as to increase the rapid response to temporary sites during outbreaks. The outbreak is the latest in a series of crises brought on by the drought, which has already caused the cost of food to rise sharply and large numbers of people—women and children in particular—to travel in search of water to keep themselves and their remaining livestock alive. “All of our animals died,” is a sentence heard in numerous informal settlement camps. One woman, whose child recovered from severe malnutrition after being treated at MSF’s inpatient therapeutic feeding center in Wardher, told a similar tale: “Before, we moved around with our animals. But our last camel has just died, and now we have to settle closer to a place where we can find a remaining source of water.” These camps are scattered throughout the zone and make a rapid response more challenging. Some 5.7 million people are in need of food aid in Ethiopia, according to the UN. Before the current outbreak was declared, MSF and the Ethiopian government had already reported an alarming increase in the number of children suffering from severe malnutrition in Doolo zone. In the first three months of 2017 alone, MSF teams in Doolo zone treated 2,352 patients for severe acute malnutrition in MSF supported centers, compared to 1,230 during the whole of 2016. Severe acute malnutrition is life-threatening, particularly for young children. MSF teams, together with the health authorities, treating people for acute watery diarrhea in Geladi and Danod have seen large numbers of children under five with clear signs of malnutrition.